Home / Housework / 12 the popular ways to get rid of the smell of cigarettes in the apartment - how to remove the smell of tobacco is easy and simple? 12 popular ways to get rid of the smell of cigarettes in the apartment - how to remove the smell of tobacco is easy and simple? How to remove the smell of cigarettes in the apartment? lady-magazine.com represents 12 popular recipes, how to get the smell of cigarettes in the room. The most effective tips on how to remove the smell of tobacco - Breathe deeply! If a family has a person smokes, the factno doubt this is a problem absolutely all the inhabitants of the house. When is summer, and the room smelled very strongly of tobacco, then just open the window wide open and moisten the air in the room in any of the known methods. See also: Aromatherapy at home. What other People's ways of getting rid of the smell of tobacco? The most proven and effective way to get rid oftobacco smell in the apartment - to quit. This method helps to 100% prevent the problems associated with the smell of smoke in the apartment and you will not need to think how to bring this disgusting "flavor". Sliced ​​orange peel, folded inbowl, can serve as a natural flavoring air and absorb the smell of smoke and tobacco. It is also possible to use coffee beans and for that purpose. These air fresheners will clean the room from unpleasant odor for a day or two. See also: Natural air freshener for your home. Buy the essential oil with the scent of your favoriteplants or fruits (available at any pharmacy). Pour into a small glass bowl of ordinary sea salt and add to the salt 3-4 drops of oil. But keep in mind that this tool will help mask the smell, but does not remove it completely. If you're tired of the smell of tobacco in the apartment, there is aOne proven method - use your favorite perfume. But do not just sprinkle them into the air, and "pshiknut" your favorite scent on a light bulb in the lamp. When you turn on the light, the room is filled with a light fresh scent. This method is somewhat similar to the principle of oil burner. But to put favorite flavor should be only a cold light bulb - if you try to put perfume on a hot lamp, she immediately burst. Take a glass of apple cider vinegar and mix it witha half cup of water. This solution will help to remove the smell from table surfaces, shelves, cabinets and other furniture. But then ventilate the room, not to leave a strong smell of vinegar. Also, this solution can be wiped wallpaper, but you need to press the cloth very well, and do not rub too hard. 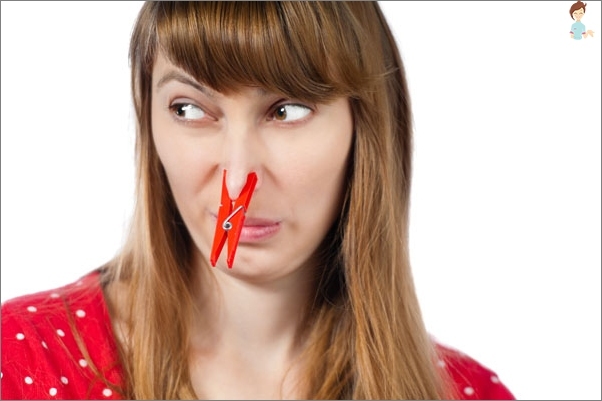 To get rid of cigarettethe smell in the room, you can take advantage of a proven solution. Mix together half a cup of ammonia, a quarter cup of baking soda, a quarter cup of vinegar and dilute the mixture into 3 liters of water. This means you need to thoroughly wash all floors and surfaces that can remain cigarette "plaque." Be sure to watch out for, so that on washable surfaces had no divorce, or smell just will not go away. As soon as the solution becomes obscenely dirty, make new and continue to wash room. If your room has a rug or carpet, theyou can be sure that he thoroughly smelled tobacco. To get rid of a persistent smell of smoke and cigarettes in the carpets with long nap, you should clean them shampoo with a little baking soda. This tool helps to clean the carpet, at the same time without damaging it. Be sure to dry the carpet after cleaning. This method helps to get rid of the smell of smokeand cigarettes on the floor. Sprinkle the entire surface of the laminate, parquet, carpet or carpet layer and a small soda, leave for a day. Then walk a vacuum cleaner and collect soda residue. As practice shows, this method can not occur immediately, but after 2-3 treatments. If you're tired of constant bad smell onkitchen or bathroom, you can pour some rice in a bowl and put it in the room where the smoke. Rice, like a sponge, absorbs the unpleasant smell of cigarette smoke. We'll have time to say goodbye to all the softtoys, decorative pillows and bedspreads. All this must be soaked in a solution of bleach and all known means "white" in order to remove the smell of cigarettes. Separately, you can put a basin of warm water and rinse all textile products in soda solution - it will help get rid of unpleasant odors. It effectively helps soap, pregrated on a fine grater and mixed with a few teaspoons of baking soda. This solution is necessary to wipe the surface of furniture, but you can also wash soft toys, pillows, blankets, and even clothing. But do not forget that some types of tissue are highly susceptible to soda, and you can ruin good clothes, using this method. Even in Soviet times, this method of disposalapartment the smell of smoke was popular. It should be easy to dip a few towels in cold water and hang them in different places apartments. Towels absorb all the odors and helps to refresh the apartment, at the same time increasing the humidity. After towel dried, they can be just thrown into the washing machine. What kind of people how to get rid of the smell of cigarettes you know? Share with us!